Get ready to bid a fond (?) farewell to this version of the X-Men. It's expected that Dark Phoenix is the last time we'll see this cast configuration, and other than the still-iffy New Mutants it may be the last time we see Marvel's mutants on the big screen for a few years. The early projections ain't looking so hot, but it's possible one more promo will turn things around. Honestly, it doesn't look that bad. Better than X-Men: Apocalypse, anyway. The latest and final trailer goes over territory we've mostly seen before, while revealing just a tiny bit more of the story. 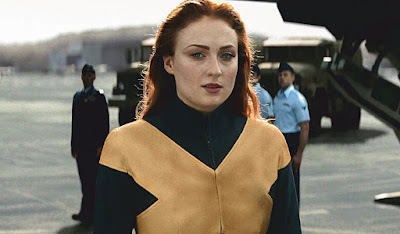 Game of Thrones actress Sophie Turner returns as the omnipath Jean Grey, who absorbs the power of the cosmic Phoenix Force and returns to Earth drastically changed. From there she's more of a threat than a friend to her X-Men chums, and if previous trailers are to be believed she even kills one of them. Meanwhile, Jessica Chastain's alien character is more mysterious than ever, and like a remnant of a time when the franchise had long-term goals. Directed by Simon Kinberg in his directorial debut, Dark Phoenix opens June 6th.